Introduction: Head injury (HI) is defined as physical damage to the brain or skull caused by external forces. The aim of this study was to examine the epidemiology of HI-related emergency department visits in our institution. Materials and Methods: This was a retrospective study of all patients with HI presenting at the accident and emergency department (AED) of the University of Port Harcourt Teaching Hospital from January 2013 to December 2014. The variables extracted for the study included patients’ age, gender, etiology, the severity of injury, the period of presentation, and the outcome of the management of HI by the AED. Results: HI occurred in 415 (30.9%) of the patients with trauma (1344) and 3.6% of all AED admissions (11,393). 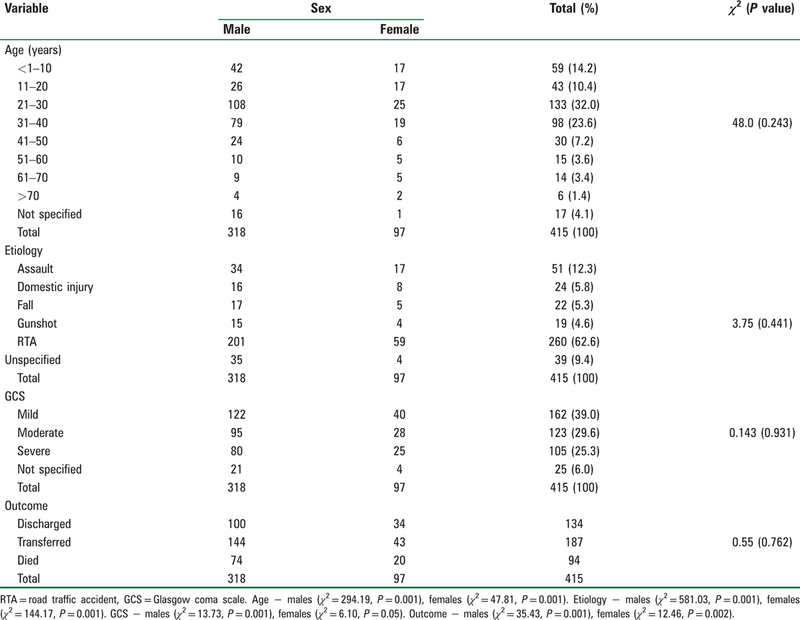 Of the patients with HI, 319 (76.9%) were males, and 96 (23.1%) were females. The male/female ratio was 3.3:1. The median age was 27 years (range − 1 month to 100 years). The highest frequency of 133 (32.0%) was in the age range of 21–30 years followed by 98 (23.6%) in the age range of 31–40 years. The most common etiologic factor was road traffic accident (RTA) [260 (62.6%)]. Most of the HIs were mild [162 (39.0%)]. More patients presented at night [161 (38.8%)]. There were 94 deaths, giving a case fatality rate of 22.6%. Conclusion: The 21–40 years age bracket was more affected by HI. RTA was the major cause of HI in our environment. The evening and night periods recorded the highest HI visits to the AED. HI affects individuals belonging to all age groups with a bimodal distribution in adolescents and the elderly, with a major predominance in the male population. TBI is projected by the World Health Organization to become the third leading cause of global mortality and disability by the year 2020. In USA, the incidence of HI at the emergency department was reported to be 394/100,000 people with a mortality rate of 19.3 per 100,000. In the United Kingdom, the attendance rate of HI at an emergency department showed that HI constituted 3.4% and the total attendance, and incidence was 453/100,000. An epidemiological study in Bangalore indicated that the incidence, mortality, and case fatality rates were 150/100,000, 20/100,000, and 10%, respectively. In Nigeria, an incidence rate of 2710/100,000 per year has been reported in an accident and emergency department (AED). It has been observed that there is a dearth of information on the epidemiology of HI in Nigeria especially in the south–south geopolitical zone of the country. Preventive effort and improvement on the quality of care for patients with HIs would be better tailored in the region if there were descriptive data on the incidence and circumstances of HI. The aim of this study was to examine the epidemiology of HI related emergency department visits in our institution, which is in the oil-rich Niger Delta region of the south–south geopolitical zone of Nigeria, with the goal of highlighting the burden of HI in the region. This will also contribute to a meta-analysis of HI epidemiology in Nigeria. This was a retrospective study of all patients presenting with HI at the AED of the University of Port Harcourt Teaching Hospital from January 2013 to December 2014. The hospital is located in Alakahia, Obio-Akpor local government area of Rivers State and has a bed capacity of 800. The study was approved by the ethics committee of our institution, and the principles of the Helsinki declaration were observed during data collection. The AED patient attendance register and transfer/discharge book as well as the AED case records for the study period were assessed to retrieve all cases of HI. The variables extracted for the study included patients’ age, gender, etiology, the severity of injury, the outcome of the management of HI in the AED, and the time of presentation. The severity category was based on an assessment of the patient’s consciousness on arrival to AED, using the Glasgow coma scale (GCS) to categorise as was the practice in our AED. GCS 13–15 was regarded as mild HI, GCS 9–12 as moderate HI, and GCS ≤8 as severe HI. Excluded from the study were patients who were dead on arrival to AED. Patients whose HI was secondary to cerebrovascular diseases, psychiatric illnesses, or seizures were also excluded. Data were analyzed using WinPepi (JH Abramson/Brixton health, Hebrew University, Jerusalem, Isreal) and Epi Info version 7.02 software (WHO, Geneva, Switzerland and CDC, Atlanta, GA, USA). Results were presented as frequencies and proportions for categoric data and mean ± SD for continuous variables, respectively. The chi-squared test was used to compare the proportions of males and females in relation to the variables. P values of 0.05 or less were considered significant. During the period under study, 11,393 admissions were made to the AED. Of these, 1344 (11.8%) admissions were trauma cases. HI occurred in 415 (30.9%) of the patients with trauma, and 3.6% of all AED admissions. Of the patients with HI, 319 (76.9%) were males and 96 (23.1%) were females, giving a male/female ratio of 3.3:1. The ages of the patients ranged from one month to 100 years. In 17 (4.1%) patients, the age was not specified. The mean age was 29.3 ± 16.2 years, and median age was 27 years (29 years for males and 25 years for females). The highest frequency of 133 (32.0%) was observed in the age range of 21–30 years followed by 98 (23.6%) in the age range of 31–40 years, as shown in [Table 1]. Children within the age range of <1–10 years were next in frequency with a total number of 59 (14.2%). On comparing gender, the differences in the age groups were not significant (χ2 = 48.0, P = 0.243). However, among the males, the difference was significant (χ2 = 294.19, P = 0.001) as well as in the females (χ2 = 47.81, P = 0.001). [Table 1] shows the frequency of the etiologic factors. In 39 (9.4%) patients, the etiology was not specified. Of the specified cases, road traffic accident (RTA) was the most common cause of HI, being present in 260 (62.6%) patients. This was followed by assault in 51 (12.3%), domestic injury in 24 (5.8%), and fall in 22 (5.3%) patients. The difference in the etiologic factors between the gender was not significant (χ2 = 3.75, P = 0.441). However, among the males and females, they were significant (χ2 = 581.03, P = 0.001 and χ2 = 144.17, P = 0.001, respectively). The GCS category was not specified in 25 (6.0%) patients. Of the patients whose GCS category were stated, mild cases, which constituted 162 (39.0%) of the total, were the most common, followed by moderate cases constituting 123 (29.6%) of the total [Table 1]. The difference in the GCS between the gender was not significant (χ2 = 0.143, P = 0.931). However, among the males, the difference was significant (χ2 = 13.73, P = 0.001) including the females (χ2 = 6.10, P = 0.05). [Table 2] shows the frequency of the etiologic factors, as well as the age. RTA was the most common cause in all the age groups. Those who were 10 years and less had the highest frequency of falls. Assault was a prominent cause of HI in the 11–40 years bracket. Gunshot injuries were common in the 21–50 years bracket. The differences were significant (P = 0.001–0.01). [Table 3] shows the distribution of those that either survived or died at the AED. Three hundred and twenty-one patients survived treatment at the AED, consisting of 244 males and 77 females. There were 94 deaths, consisting of 74 males and 20 females, from HI in the AED, giving a case fatality rate of 22.6%. The highest frequency of survivors were in the 21–30 years age group [104 (32.4%)]. RTA was the most common etiology [187 (58.3%)], and most of the survivors had mild HI [161 (50.2%)]. The most common age group in which deaths were reported was the 21–30 years group [29 (30.9%)]. RTA was the major cause of death [73 (77.7%)], with the majority of deaths occurring in those who had severe HI [83 (88.3%)]. On comparing gender, the difference in age among those who survived was not significant (χ2 = 11.68, P = 0.111), and this was the same for those who died (χ2 = 12.26, P = 0.092). In terms of etiology, the difference was not significant for those who survived (χ2 = 6.27, P = 0.180) and those who died (χ2 = 3.03, P = 0.552). The difference in the GCS between the gender was not significant among those who survived (χ2 = 0.78, P = 0.679) as well as in those who died (χ2 = 0.29, P = 0.866). 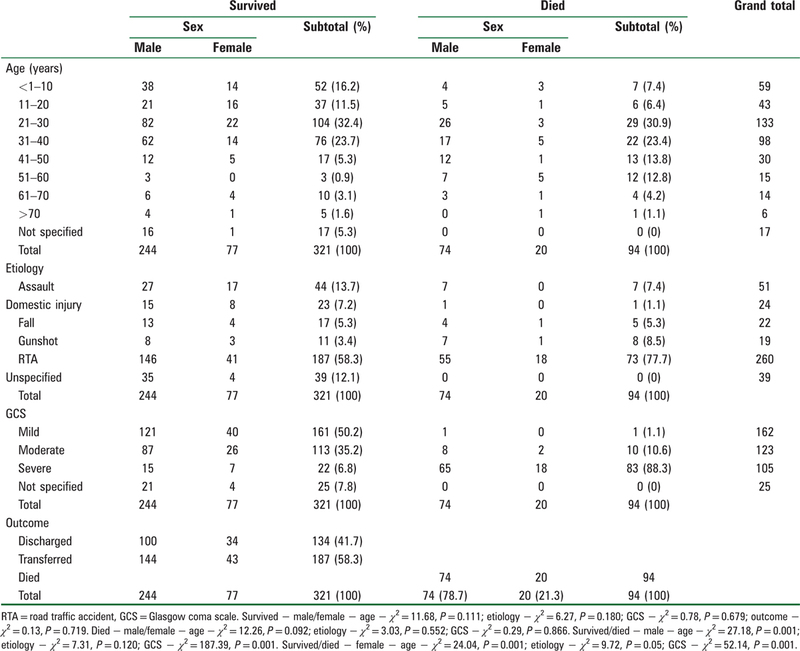 Comparing the males who survived and those who died at the AED, the difference in age was significant (χ2 = 27.18, P = 0.001), and this was the same for the females (χ2 = 24.04, P = 0.001). With regard to the etiology, the difference in the males who survived and those who died at the AED was not significant (χ2 = 7.31, P = 0.120), but it was significant for the females (χ2 = 9.72, P = 0.05). The difference in GCS for the males who survived and those who died was significant (χ2 = 187.39, P = 0.001) including for the females (χ2 = 52.14, P = 0.001). Of the 415 patients, only 187 (45.1%), consisting of 43 (23.0%) females and 144 (77.0%) males, were transferred to the ward. The highest transfer was to the male surgical ward with 95 (50.8%) patients, followed by the children surgical ward with 47 (25.1%) patients. One hundred and thirty-four (32.3%) patients were discharged home. The patients presented at various times to the AED. One hundred and twenty-four (29.9%) patients presented between 8 AM and 2 PM, 130 (31.3%) patients presented between 2 PM and 8 PM, and 161 (38.8%) patients presented between 8 PM and 8 AM. Two hundred and eighty-two (68.0%) patients presented to the AED in 2013 and 133 (32.0%) in 2014. There were industrial strikes in March, June, and August of 2013. In 2014, there were industrial strikes from February to March, July to September, and November to December. HI is a significant public health burden, and the awareness of the extent of the burden would be necessary in planning strategies for managing these patients in the hospital especially in the emergency department. In this study, HI occurred in 30.9% of all patients with trauma admitted in the AED. This is similar to the 25% recorded in a similar study in a nearby state. Most of the affected persons are within the youthful age of 21–40 years, which is the period of peak activity and productive age. This corroborates the findings of others.,, Among the children, the age group of <1–10 years had the highest frequency. In addition, in this age group, RTA was the most common etiologic factor followed by falls. This deviated slightly from the finding in a previous study wherein fall was the most common among children. RTA was also found to be the most prevalent in all the age groups and in both males and females. This is in keeping with the reported high rate of HI resulting from RTA in previous studies.,, However, it was at variance with the report from the developed countries, where fall was the most prevalent., This difference could be as a result of generally lower RTA rates, good road network, well-coordinated transportation system, and a good enforcement of traffic rules practiced in the developed countries, which is not the same in developing countries especially in Nigeria, where a lack of enforcement of the traffic rules and bad road network had worsened the risk to HI. In the present study, the case fatality rate in the AED was 22.6%. This is higher than the rates reported by Emejulu et al. (5.5%) and Bock-Oruma et al. (6.8%). The high case fatality rate is related to differences in the severity of the HI, as well as patient characteristics and management. The frequency of AED visits in this study was found to be higher during the night duty shift, which extends from 20:00 to 08:00 of the next day. This was followed by the evening duty period, which extends for 14:00 to 20:00. In effect, majority of the traumatic HIs presented during the later part of the day when activities in schools, on the road, and at work are at the highest. Similar observation was reported by Emejulu et al. in a similar study in the southeastern part of our country. Hence, there is a need to increase the staff strength in the emergency department during these periods and provide adequate facilities necessary for the management of patients with HIs, and indeed, all patients presenting to the emergency department for care.In the present study, there were fewer cases in 2014 compared to 2013. This was partly contributed to by industrial disharmony, with health workers embarking on an industrial strike. This led to the closure of the hospital during the periods of the strike and thus affected hospital admissions. A study on industrial strikes, which included our study period, has been conducted by Oleribe et al. The present study had limitations. Being a retrospective study, there was a loss of important information, which could have been relevant. For instance, information on patient management in some patients was not specified in the records. A disadvantage of retrospective studies is poor record keeping, because it relies on the accuracy of written records. This is particularly so in our environment, where poor record keeping is common, and most hospitals are without an electronic recording system. Patients belonging to the 21–40 years age bracket were more affected by HI. People in this age bracket are considered very active and productive. RTA was the major cause of HI in our environment, as demonstrated in this study. This study had also shown that the frequency of visit was higher during the peak period of activities on the road. The evenings and night periods were found to have recorded the highest HI visits to the AED. Barr RM, Gean AD, Le TH. Craniofacial trauma. In: Brant WE, Helms CA, editors. Fundamentals of Diagnostic Radiology. 4th ed. Philadelphia: Wolters Kluwer Health/Lippincott Williams & Wilkins; 2012. p. 49–74. Dziadzko V, Dziadzko MA, Gajic O, Karnatovskaia L. Approaching psychological trauma of the critically ill: Patient and family perspectives. Am J Respir Crit Care Med 2016;193:A4744. Humphreys I, Wood RL, Phillips CJ, Macey S. The costs of traumatic brain injury: A literature review. Clinicoecon Outcomes Res 2013;5:281–7. Shivaji T, Lee A, Dougall N, McMillan T, Stark C. The epidemiology of hospital treated traumatic brain injury in Scotland. BMC Neurol 2014;14:2. Tran TM, Fuller AT, Kiryabwire J, Mukasa J, Muhumuza M, Ssenyojo H et al. Distribution and characteristics of severe traumatic brain injury at Mulago National Referral Hospital in Uganda. World Neurosurg 2015;83:269–77. Murray CJ, Lopez AD. The Global Burden of Disease: A Comprehensive Assessment of Mortality and Disability from Diseases, Injuries, and Risk Factors in 1990 and Projected to 2020. Cambridge, MA: Harvard University; 1996. Thurman D, Guerrero J. Trends in hospitalization associated with traumatic brain injury. JAMA 1999;282:954–7. Yates PJ, Williams WH, Harris A, Round A, Jenkins R. An epidemiological study of head injuries in a UK population attending an emergency department. J Neurol Neurosurg Psychiatry 2006;77:699–701. Agrawal A, Munivenkatappa A, Shukla DP, Menon GR, Alogolu R, Galwankar S et al. Traumatic brain injury related research in India: An overview of published literature. Int J Crit Illn Inj Sci 2016;6:65–9. Emejulu JK, Isiguzo CM, Agbasoga CE, Ogbuagu CN. Traumatic brain injury in the accident and emergency department of a tertiary hospital in Nigeria. East Cent Afr J Surg 2010;15:28–38. Teasdale G, Maas A, Lecky F, Manley G, Stocchetti N, Murray G. The Glasgow coma scale at 40 years: Standing the test of time. Lancet Neurol 2014;13:844–54. Bock-Oruma AA, Odatuwa-Omagbemi DO, Ikubor JE. Pattern of head injury in the emergency department of the Delta state university teaching hospital, Oghara, Nigeria. Br J Med Med Res 2016;15:1–6. Ketema I. Pattern of head injury among patients presented to adult emergency department of Jimma University Teaching Hospital, Jimma, South West Ethiopia. MSc Thesis. Addis Ababa University. Available from: http://hdl.handle.net/123456789/7552. [Last accessed on 2017 Mar 12]. Jasper US, Opara MC, Pyiki EB, Akinrolie O. The epidemiology of hospital-referred head injury in Northern Nigeria. J Sci Res Rep 2014;3:2055–64. Boniface R, Lugazia ER, Ntungi AM, Kiloloma O. Management and outcome of traumatic brain injury patients at Muhimbili Orthopaedic Institute Dar es Salaam, Tanzania. Pan Afr Med J 2017;26:140. Jennett B. Epidemiology of head injury. J Neurol Neurosurg Psychiatry 1996;60:362–9. Quayle KS, Powell EC, Mahajan P, Hoyle JD Jr, Nadel FM, Badawy MK et al. Epidemiology of blunt head trauma in children in US emergency departments. N Engl J Med 2014;371:1945–7. Stead LG, Bodhit AN, Patel PS, Daneshvar Y, Peters KR, Mazzuoccolo A et al. TBI surveillance using the common data elements for traumatic brain injury: A population study. Int J Emerg Med 2013;6:5. Adeolu AA, Malomo AO, Shokunbi MT, Komolafe EO, Abiona TC. Etiology of head injuries in Southwestern Nigeria: A public health perspective. Internet J Epidemiol 2004;2. Available from: http://ispub.com/IJE/2/2/11684. [Last accessed on 2017 Mar 12]. Palacios EM, Yuh EL, Chang YS, Yue JK, Schnyer DM, Okonkwo DO et al. Resting-state functional connectivity alterations associated with six-month outcomes in mild traumatic brain injury. J Neurotrauma 2017;34:1546–57. Oleribe OO, Ezieme IP, Oladipo O, Akinola EP, Udofia D, Taylor-Robinson SD. Industrial action by healthcare workers in Nigeria in 2013-2015: An inquiry into causes, consequences and control − A cross-sectional descriptive study. Hum Resour Health 2016;14:46. Hess DR. Retrospective studies and chart reviews. Respir Care 2004;49:1171–4. Adebayo SB, Awosanya GO, Balogun BO, Osibogun A. Multicentre assessment of radiology request form completion in south-west Nigeria. Niger Hosp Pract J 2009;3:12–3.